For the planet, see Cote d'Azure. Côte d'Azur was a coastal city that was the main population center of Sigma Octanus IV, a human colony world in FLEETCOM Sector Three. The population of Côte D'Azur was estimated to be 300,000, nearly all of whom were killed during the Battle of Sigma Octanus IV. Côte d'Azur's citizens grew rice paddies outside of the city. The main sections on the latter interior of Côte d'Azur were the wharf and bay areas, the residential section, the downtown, and the docks. Côte d'Azur had a sewer system under the city. The sewer systems had steel pipes running along the top of the plastic conduits. The sewer systems had a two meter diameter pipe, with a steel grate, on the beach side near the edge of the city. The inhabitants used sodium vapor lamps, which washed everything above with an eerie glow. In the year 2552, the Covenant launched a small attack against the Sigma Octanus system in hopes to retrieve a Forerunner artifact that was on display at the Côte d'Azur Museum of Natural History on Sigma Octanus IV's surface. When the Covenant invaded Côte d'Azur, they killed the entire population, save for twenty civilians (some of whom were wounded) who hid in a cargo ship. It is assumed that these twenty are the only to have survived. 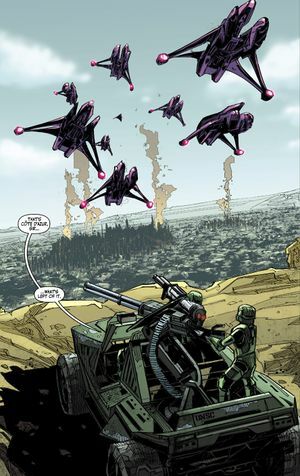 The Covenant were in the process of securing the artifact and relaying messages to the ships above when the SPARTAN-II Blue Team entered the city. Blue Team managed to retrieve the artifact, save the remaining civilians, and escape back to their Pelican Dropship. Upon entering the Pelican and exiting the atmosphere, John-117 detonated a HAVOK tactical nuclear weapon underneath the city streets, which destroyed the city and prevented the Covenant from finding anything else of value. Sigma Octanus IV and the remnants of Côte d'Azur still remain under human control. The city was probably named after the real Cote d'Azur, a region in the French Riviera which translates as "Blue Coast".